Oswego County BOCES School Counselors Jo Ann Smegelsky, Colleen Martin, and Stacey Turtura were featured presenters at the recent Western New York School Counselors Consortium Conference in Rochester. The trio shared with an audience of kindergarten through grade twelve school counselors the steps for implementing the ASCA (American School Counselor Association) model in special education settings. 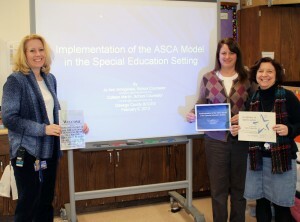 Oswego County BOCES School Counselors Colleen Martin, left, Stacey Turtura, middle, and Jo Ann Smegelsky. This included how OCB’s diverse and proactive counseling services model assures the delivery of high quality programs that is accountable for student growth and can be evaluated continuously based upon student achievement and development. OCB counselors support identified students’ social, emotional, and behavior needs through the following preventative activities: social skills instruction in the classroom; conflict resolution and problem solving in the classroom; consultation with staff on behavior and interventions; a Check and Connect engagement and intervention program; Functional Behavior Assessments (FBA) and Behavior Intervention Plans (BIP) development and monitoring, as well as mentoring. The trio also shared a matrix of the elements of school based counseling at OCB that identifies the parameters for frequency of services, targets student outcomes, and counselor activities.